Got Kids? Do They want a pet? Of course they do. they're kids! From staying sane while choosing a pet (whether with teens or toddlers) to getting the kids to pitch in on daily walks or weekly cage or litter box cleaning, the $2.95 aFamily Zoo ebook can help make life with pets and kids run smoothly. "Mommy, can I get a _______?" If you've heard that question, and are debating an answer that will keep you - and the kids - happy in the weeks and years to come, this is your must-have book before you agree to bring a pet home. From determining the right pet for your child based on his or her age, to deciding how much time and money said pet will ultimately cost, to knowing the lifespan, care and feeding requirements of your child's desired pet - with cleaning tips for when you ultimately bring the perfect pet home - Taming the Family Zoo has you covered. You're not alone in being overwhelmed by wanting to make them happy - yet knowing a simple 'yes' could saddle you up for years of animal care. If my three kids had their way, every inch of our home would be a nesting spot for some animal or another. So I began by having them do research on their animal of choice, and began thinking of ways to ensure the pet would be their pet - not mine solely to care for. And it worked! You'll find real life solutions like these in Taming the Family Zoo. Taming the Family Zoo is a mom's guide to help parents faced with the same dilemma make wise choices for the kids, and the family. So that at the end of the day, you know what you're getting into, how much it will cost, and how the kids can help clean up after, and feed and care for, your newest family member. The $2.95 e-book price is about the same you'd pay for a week's worth of dog kibble - and equally as useful! You can pay with Paypal or a credit card and have instant access to this 29-page e-book. 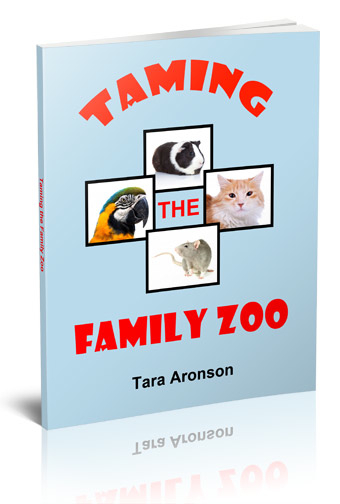 Order your copy of Taming the Family Zoo, an original, never-before-published, 29-page guide filled with pet tips, cleaning strategies, care guides and more so that you can tame - and enjoy - your own family zoo. Ready to Give it a Try for $2.95? Get it NOW and download instantly after purchase!